← Monday, May 11, 2015 – Who’ll Stop The Rain? Did you know the oldest living World War II veteran is 109 year old Richard Overton? And he lives in Austin, Texas. Mr. Overton served in the all-black 1887th Aviation Engineer Battalion from 1942 until 1945. Unfortunately, I only know Mr. Overton via the news. Did you know that World War II veterans are passing away at a rate of almost 900 PER DAY? With Memorial Day approaching, I think about all who serve and sacrifice. Notice the present tense is intentional. If I were to die today, I would be proud to say that I knew Major Thomas W. Matthews. You will hear more about him and two others from World War II in the coming days. Lieutenant Matthews was a pilot. After the war ended, 70 years ago this month, he went to the Texas Agricultural and Mechanical College in College Station and became a veterinarian. He practiced until he was in his late 80’s. He rose the rank of Lt. Colonel in the Air Force Reserves. Here is a photo of Dr. Matthews and me at the World War II Memorial in Washington D.C. 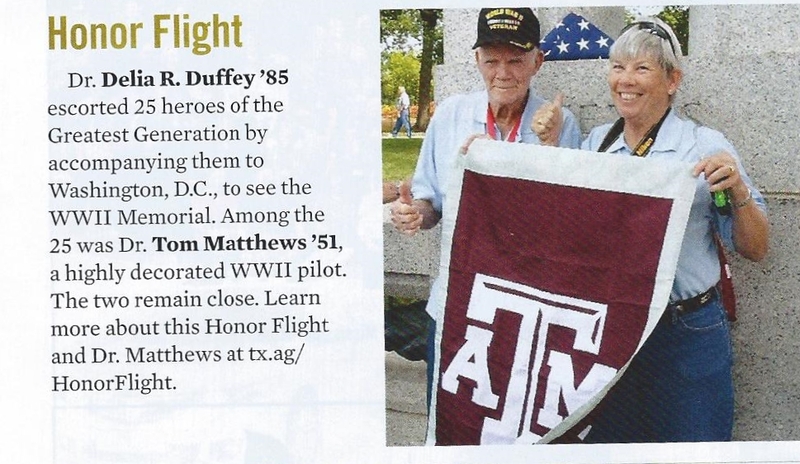 It was taken on the maiden Honor Flight from Austin, June 2012 taking veterans to visit their World War II Memorial. 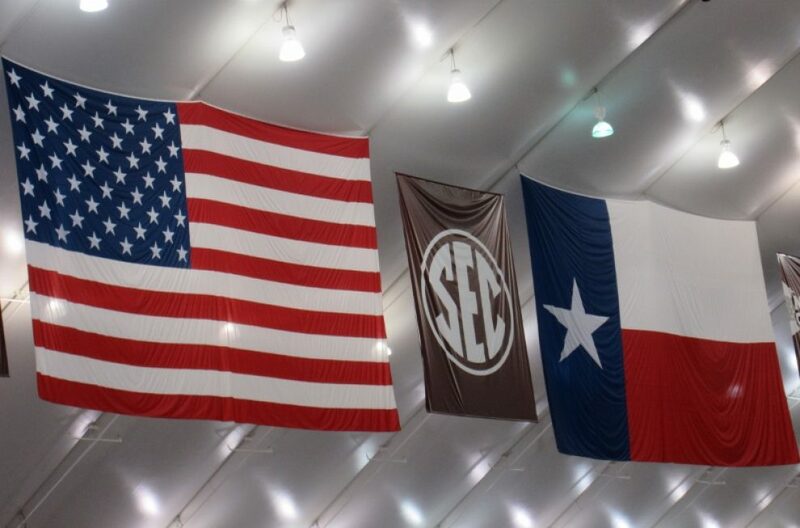 This photo was in the Texas Aggie magazine of March/April 2013. It was said that Dr. Matthews showed the picture to any and all at every VFW meeting and anyone who would stop and listen. I heard he carried the magazine with him at all times. Dr. Matthews passed away at age 90 July 15, 2013, shortly after the magazine came out. What can you say you have done for a World War II veteran, Purple Heart recipient and hero? Joseph Heller’s book, Catch 22, is based on the airmen stationed in Corsica with then, Lt. Matthews. If nothing else, remember all who served and pray for all who continue to protect us and keep freedom for us. If you see a soldier today, pat them on the back and say “Thank you.” They are indeed, The Greatest Generation. This entry was posted in Uncategorized and tagged Honor Flight, Texas A&M, The Greatest Generation, World War II, World War II veterans. Bookmark the permalink. Thanks for this story…I remember your telling me about it at SPQ. Nice to see the picture.